Nicola Sturgeon has said Scotland's right to hold an independence referendum is at the heart of the election. Speaking in Aberdeenshire, the SNP leader also said only her party could stop Theresa May having a "free hand". Meanwhile, former Better Together head Alistair Darling urged voters to reject calls for a second referendum. And the Conservatives repeated their calls for Ms Sturgeon to "focus on the day job". During a visit to Dreams Daycare nursery in Insch on Monday, the first minister said: "The issue at the heart of this election is, whether you support independence or oppose independence, surely that decision should be taken by people in Scotland, by the Scottish people and the Scottish Parliament, and not by a Tory government at Westminster." Ms Sturgeon, who was campaigning alongside Alex Salmond, highlighted the "stark contrast" between her party's investment in childcare and the prime minister's cuts to child tax credits. The Scottish government currently provides 16 hours a week of free childcare for three and four-year-olds and vulnerable two-years-olds, and has pledged increase this to 30 hours by 2020. Ms Sturgeon said: "We've got to make sure that there's a check on the Tories, that there's strong opposition and strong voices for Scotland standing up for progressive policies like this one, and that in Scotland can only come from the SNP." 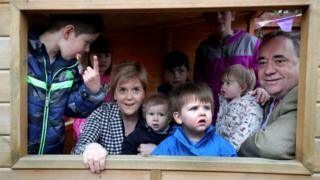 The nursery visit came after Prime Minister Theresa May visited the north-east of Scotland at the weekend, when she issued an appeal to Scottish voters who oppose independence. Mrs May said: "We want to ensure that we build a more secure and united nation. That means taking action against the extremists who would divide us and standing up against the separatists who want to break up our country." Ms Sturgeon warned the Conservatives to "watch their language" and accused Labour of focusing on independence due to a lack of positive policies, after Lord Darling called on the SNP to rule out a second referendum. Lord Darling, who served as chancellor in Gordon Brown's Labour government, was campaigning in the Edinburgh South seat which was won by Labour's only Scottish MP, Ian Murray, at the last general election in 2015. The visit came on the 20th anniversary of Labour winning the 1997 election under Tony Blair - and ahead of the forthcoming general election on 8 June. Lord Darling highlighted Labour's achievements in government, including lifting 120,000 children out of poverty in Scotland, introducing the national minimum wage and introducing tax credits for those on low pay. He said: "Labour's proud record shows what can be achieved when a government focuses on the day job. "The priority of a Labour government is always to grow the economy, create jobs, lift people out of poverty and give everybody a fair chance in life, not seeking to divide the country." But he conceded that the best result Labour can realistically achieve in the general election is to be a "sizeable opposition" to the Conservatives. Asked if he endorsed Jeremy Corbyn, Lord Darling said: "Well, he is the leader. He's the leader for the next, you know, right up until the general election. "You know where I stand on that. My view is we need to get on. We're fighting in a general election campaign. You know, leaders come and go." Lord Darling also called on voters to back Labour on 8 June in order to "send Nicola Sturgeon a message that Scotland doesn't want or need another divisive referendum". He added: "The choice in British politics now isn't the old left-right, it is now dividing along nationalistic lines, whether it is Brexit nationalists and Scottish nationalists, against the majority who I believe want to see a sensible outcome." The Scottish Conservative candidate for Edinburgh South West, Miles Briggs, said that Labour was hoping to "sell pro-UK Scots down the river" by doing a deal with the SNP after the election. Mr Briggs said: "Labour may think wheeling out Alistair Darling will convince voters they are strong on Scotland's place in the union. "But they know Jeremy Corbyn is itching to do a deal with the SNP that would sell pro-UK Scots down the river. "Labour would return the UK to chaos, and turn their back on the two million Scots who voted No in 2014." Scottish Conservative leader Ruth Davidson was at St Abbs lifeboat station in the south east of Scotland, where she repeated her calls for the SNP to forget about an independence referendum and instead focus on the "day job" of running schools and hospitals. "So today we are saying to the SNP - give up this divisive independence referendum idea and get back to your day job." Elsewhere, Scottish Liberal Democrat leader Willie Rennie joined some of the party's council election candidates and activists in Perthshire and Bridge of Allan. During the visit, Mr Rennie highlighted the "great work" that Liberal Democrat councillors do to help their local communities. Mr Rennie said: "Alistair Darling knows that Jeremy Corbyn is incapable of providing a strong opposition to this Hard Brexit Conservative government. "It is only the Liberal Democrats who stood up when it counted, Labour cowered in the corner." He also said education, the health service and Brexix were all merely "convenient vehicles" in Ms Sturgeon's quest for independence.